So how is this helping me, as a chronic fatigue sufferer? Anyone who has an illness that leaves them with no energy and in pain will know how hard it is to keep on top of your home. I have always been house-proud and whilst cleaning has never been my favourite job in the world, I kept on top of my jobs, my house always smelt nice and I was proud to keep it looking good. However throw in a chronic illness, two children and a messy husband and my once-clean house no longer exists. It is quite hard to walk around a dirty, untidy house when you are a clean and tidy person and saying that the state of it gets me down is an understatement. I still despair at several rooms in my house and at the moment the state of the playroom is so overwhelming I'm just shutting the door and hoping it clears itself. When you have just enough energy to get dressed, give the kids breakfast and get them to school before you climb back into bed on a morning, clearing the pile of clothes on the wardrobe floor or tidying the carrying the growing amount of crap on the stairs goes on the back burner. As a result piles and piles of stuff have been building up in my house, alongside the strain on my mind. As daft as it may seem, these things can really get you down and affect your mental health. When I first came across Mrs Hinch I dismissed her outright, I had no energy to clean so what was the point in even watching her? However, one late night when I couldn't sleep I decided to have a nosey, and it changed my mind completely. 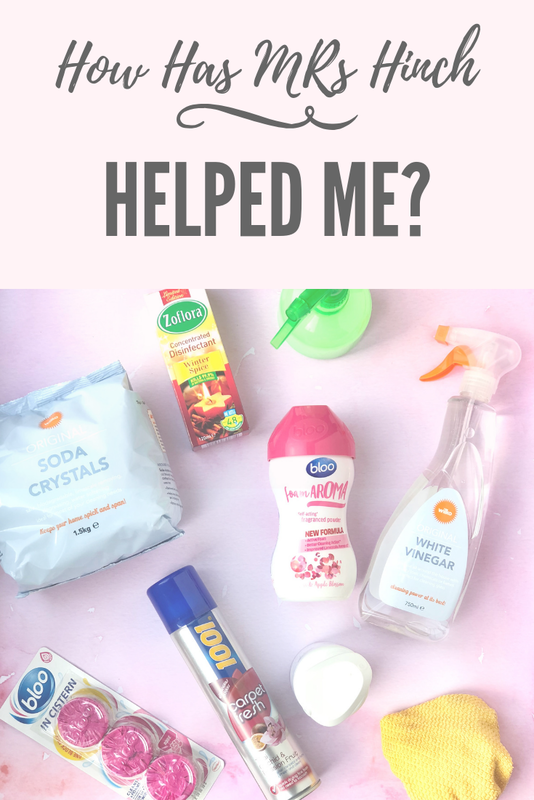 Sophie breaks her cleaning tasks down into small manageable amounts, she talks you through each thing she recommends and even has a list of all the products she uses and where you can find them. Not to mention how fun and inspiring her videos are, there is something about them that make you want to join in. Before I knew it, I had raided my local pound shops and stocked up on various products she uses. I was zoflora-ing my cloths, spraying my living room with fabric softener and putting soda crystals down my sinks. Just little jobs that make so much difference when you walk into a room and it looks nice and smells fresh. It takes a weight off my mind that these things are getting done without me using too much energy and that I can get up on a morning feeling better about my home and myself. If you haven't had a look at Mrs Hinch's profile or have maybe dismissed her because 'is she really teaching us anything we don't already know?' then I'd urge you to give her a chance and maybe she will motivate you to do something that might help. She is sunny and warm, she loves her "Hinch Army" who have got behind her and, at the end of the day, she's certainly not harming anyone. If one person can help motivate me when I was at an all-time-low and make me feel good about my house again they're good in my book!